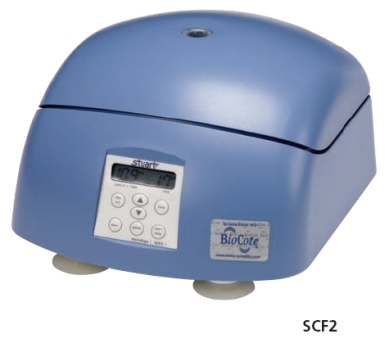 The SCF2 is a compact microcentrifuge for centrifugation of up to 12 x 1.5ml or 2.2ml microfuge tubes or four strips of 8 x 0.2ml tubes at speeds of up to 13,500rpm. The unit is supplied with adaptors for use with the fixed angle rotor to enable 0.5ml and 0.2ml tubes to be centrifuged. The rotors are easily installed without the use of tools. Centrifugation speed can be displayed as either rpm or rcf and the timer can be set for run times of between 1 and 30 minutes. In addition, a pulse button enables a rapid spin down by accelerating the rotor to the preset rpm then promptly decelerating. For safety, the door of the SCF2 remains locked while the rotor is in motion.